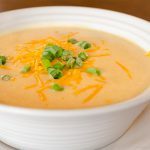 Loaded baked potato soup – Listed in the recipe are the ingredients I had on hand when I got the most compliments on it, but I typically am a garbage-head soup maker. I’ll throw anything in there that needs to be used up. This time I had red onions on hand, but I bet white would give you the same effect. Here’s my recommendation on variations: make this version first. The next time, if you’re being adventurous, try sneaking in a new veggie. The blending method will throw them for a loop, just be careful to use vegetables which compliment each other. I don’t think beets would work in this one, but maybe an avocado would. Let me know what you come up with if you try something new. If you don’t have an immersion blender, check it out. It will save you the effort (and extra dishes) by allowing you to blend it straight in the pot. I have one similar to this one. I had extra biscuits to use, to be more exact, I had these cheddar sage biscuits. To bring those bad boys back to life (they were a couple days old), I preheated the oven to 350 degrees and baked them on a cookie sheet for 15 minutes. Good as new and they complimented the soup very well. As far as the shredded cheese goes, add that to taste. My family loves cheese. So, maybe two cups will be enough for you. Also, there is a tiny kick to the soup due to the cayenne pepper. If you’re not digging the heat, cut back or eliminate it there. Enjoy! A smooth, creamy soup with all your favorite baked potato flavors, including BACON! This is a great recipe to sneak in extra vegetables. Wash, peel and cut the potatoes, carrots, onion, celery, and scallions. Set aside. Chop the bacon into bits. Cook the bacon in a stock pot until crunchy. Remove bacon and drippings from the pot leaving 2 tablespoons to remain. Save the bacon. Discard the excess drippings or save for another use. Have the chicken broth ready. Into the bacon grease which remains in the stockpot, add the flour. Cook on medium/low heat for 1-2 minutes, stirring constantly with a whisk to eliminate lumps from forming. (Be careful, flour burns quickly). Once the flour mixture is light golden brown, slowly whisk in the chicken broth. Bring the mixture to a boil on medium/high heat. Add the chopped carrots, potatoes, celery, and red onion. Boil for 15 minutes or until tender. Add the seasoning: salt, cayenne pepper, black pepper, garlic powder. While still warm stir in the shredded cheese and reserved bacon. (Save a little bit to sprinkle on the top later). Once slightly cooled, stir in the sour cream and half & half. Serve with shredded cheese, bacon bits, and chopped scallions on top.